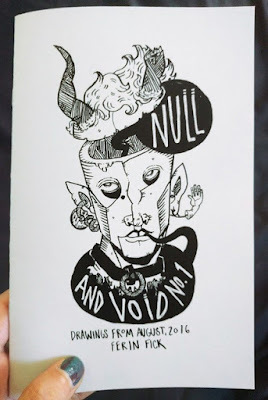 This zine is a collection of comics and illustrations by the artist. While it doesn't tell a story nor does it have a theme there are a few topics that hold the collection together namely body image, God and death. I'm not sure what the name is for this style of art but the words that immediately come to mind are punk, goth and creepy. I can't say I really appreciated any of the ideas the author is trying to impart as I just didn't "get" most of it. However, I do appreciate the art itself. I found it compelling and stared into many images noticing something different each time. Would enjoy seeing more of the artist's work.